View the Full Report in PDF here. 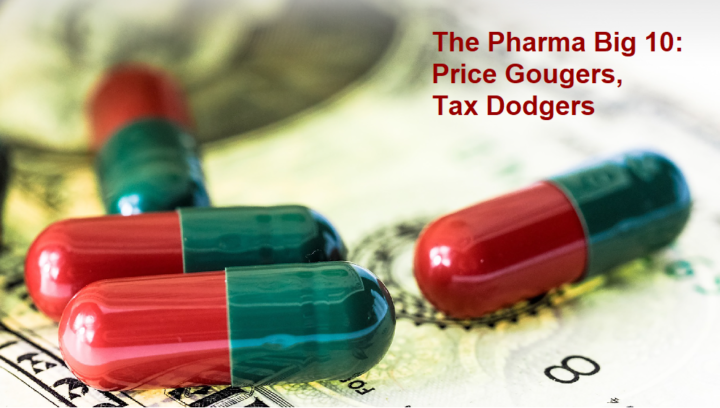 The report examines the profits, taxes, and drug prices of the 10 biggest U.S. pharmaceutical companies, the “Pharma Big 10”: Johnson & Johnson, Pfizer, Merck & Co., Gilead Sciences, AbbVie, Amgen, Eli Lilly & Co., Bristol-Myers Squibb, Biogen and Celgene. Between 2011 and 2015, the Pharma Big 10 jacked up the prices charged to consumers and Medicare and Medicaid for 31 of their most widely-prescribed drugs by at least 40% and as much as 71%—at least 4 times the rate of prescription-drug inflation and up to 14 times the general rate of inflation. Worldwide corporate profits of the Pharma Big 10 jumped by 39% over that same 2011-2015 period, from $58.8 billion to $81.5 billion (and to $83.4 billion, or by 42%, between 2011 and 2016). The Pharma Big 10 had $506 billion in untaxed profits stashed offshore in 2016. These profits increased by 65% from 2011, as drug prices soared. U.S. tax law allows companies to indefinitely delay paying federal taxes on profits booked and kept offshore. The Pharma Big 10 owe an estimated $133 billion on their $506 billion in offshore profits if they are repatriated to the U.S. at the 35% rate less credit for foreign taxes paid. The tax bills passed by the House and Senate would slash the tax rate on these profits to 14% in the House and to 14.5% in the Senate (rates are based on cash assets, and would be much lower if based on non-cash assets such as plants and equipment). That means they would pay an estimated $55 billion in taxes on the profits, for a tax cut of nearly $80 billion. President Trump and the GOP Congress are working overtime to provide a massive tax cut to corporations on their accumulated offshore profits and rewrite the way offshore profits are taxed in the future. Drug companies will be among the biggest winners if this effort succeeds—but it’s hard to imagine less deserving beneficiaries. Like a boxer in a lab coat, America’s prescription drug industry has for years been clobbering working families with a devastating, one-two punch to their health and economic well-being. First, the pharmaceutical industry gouges the public with outrageous prescription-drug prices and runaway profits, straining the budgets of consumers and public health systems alike—sometimes even pricing patients out of a cure. Then through offshore tax dodging, the drug industry avoids paying tens of billions of dollars in U.S. taxes on those inflated profits. This widespread tax avoidance threatens funding of public services—such as health care—that working families, small businesses and local communities need to survive and thrive. Deeply discounting the taxes owed on $506 billion in offshore profits held by the top 10 drug companies examined in this report. It is estimated that these companies owe about $133 billion on their untaxed offshore profits and under the House and Senate tax legislation will pay about $55 billion in taxes on them—giving the corporations a tax cut of nearly $80 billion. Creating a “territorial” tax system that will charge U.S. corporations a much lower tax rate on their foreign profits than on domestic profits. This will provide even more incentives than exist today to ship profits, investment and jobs offshore. Corporations do not deserve such special treatment—least of all drug companies that price-gouge consumers and taxpayer-supported healthcare programs like Medicare and Medicaid. Medicare drug prices: Jumped by an average of 44% for all 24 of the companies’ drugs for which pricing data for 2011 to 2015 is available on Medicare’s drug spending dashboard. This price hike is 4 times the rate of prescription drug inflation (11%) and 9 times the rate of general inflation (5%) during that period. Medicaid drug prices: Rose by an average of 40% for all 13 of the companies’ drugs for which 2011-15 pricing data is available on Medicaid’s drug spending dashboard. This price hike is nearly 4 times the rate of prescription drug inflation and 8 times the rate of general inflation. Retail prices: Nine of their most widely-prescribed drugs for older Americans spiked by an average of 71%—about 6.5 times the rate of prescription drug inflation and 14 times the rate of general inflation. During those five years, more than $120 billion was spent on this sample of prescription drugs through Medicare and Medicaid. Worldwide corporate profits of the Pharma Big 10 jumped by 39% over that same 2011-2015 period, from $58.8 billion to $81.5 billion (and to $83.4 billion, or by 42%, between 2011 and 2016). Worldwide sales, which neared $300 billion in 2015, were up only 5% over that timeframe, indicating drug companies were squeezing more profit from every sale. Healthcare companies, primarily pharmaceuticals, own 22% of the total $2.6 trillion in untaxed profits U.S. corporations hold offshore. They claim the second biggest share after the information technology industry. Drug companies comprise 9 of the top 30 profit-offshoring corporations. Drug companies are particularly adept at shifting profits offshore. By manipulating their valuable intellectual property—principally, drug formulas—pharmaceutical companies can easily shift profits made here to offshore tax havens. Among the evidence of such profit shifting: in 2016, the Pharma Big 10 made 57% of their sales in the U.S. but only booked 23% of their profits here. Rather than use their big tax cuts to invest in new drug treatments, drug companies are more likely to enrich shareholders and CEOs with stock buybacks and dividend payouts. From 2011 to 2016, the Pharma Big 10 spent more than 100% of their net income on dividends and stock buybacks and 80% of their net income on research and development. This suggests that a large portion of a corporate tax cut will be used to enrich already wealthy shareholders and well-paid executives rather than to research new cures. Wall Street has rewarded drug companies’ aggressive price gouging with booming stock prices. The stock-price increases of all but one of the Pharma Big 10 firms exceeded the gains in the benchmark S&P 500 from 2011 to 2015, in most cases by double or more.